Click here to go to the "Riddle of MEMS"
Here's a new page on microstrip losses due to substrate conduction, an important topic for anyone considering MEMS switches on high-resistivity silicon! In 2004 we originally posted the Riddle of MEMS, maybe it's time for a second look. So far only one person came forward to defend the technology, too bad he couldn't take a joke well enough to contribute any real content. If anyone wants to contribute content to this page (or start another page!) please contact us! Images are the big thing we are missing. Two, three or four terminals? The origin of electromechanical switches dates back to the days of telegraph cables. The repeater relay was used to boost weak signals along long lines. It was cheaper than employing a telegraph operator to listen to the weak signal and rekey it! Here's a web site that's devoted to early patents of telegraph equipment, it seems like every year there was a new repeater relay in the works on both sides of the Mason Dixon line. The flowery prose that is contained in some of these patents is solid gold! This was the day before empty suit patent lawyers got involved and turned patent disclosures into gibberish. 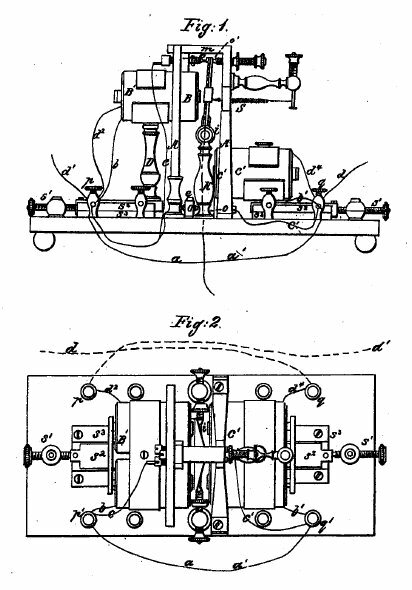 The image at the top of the page is from U. S. Patent 13,655, issued to a Mr. Peaslee on October 9, 1855. Can someone help us out with some "modern" history of MEMS switches? MEMS stands for micro-electro-mechanical systems. Note that MEMS does not represent the plural of "MEM". Usually no one will correct such misuse, but this explains the rolling eyes at a meeting where Mayor McCheese asks if anyone "knows anything about MEM phase shifters..."
Electrostatic force can be used to attract objects or repel objects; opposite charge attracts, like charge repels. In a MEMS switch, one contact is usually grounded while the other contact is charged, so MEMS switches use electrostatic attraction, not repulsion (but never say never...). The polarity of the control signal doesn't matter, it will always be "opposite" the ground potential. The control signal doesn't even have to be a DC voltage, AC voltage will act to close the switch. Quiescent power of a MEMS switch is essentially zero, DC current is zero. For that matter, the power dissipated in dynamic switching is pretty low, because the rate that you can operate the switch is much much lower than you might a solid-state component. The applications of MEMS goes far beyond microwave hardware. One product that MEMS is used in is accelerometers for triggering airbags, another is projection television where MEMS is used to form an array of tiny mirrors that can be tilted to project color pixels (called digital micromirrors, or DMM). Forget about projection TVs, fatboy, get off the couch and go to the library for Chrisake. For microwave systems the primary use of MEMS is to create tiny mechanical electro-statically controlled mechanical switches which can be used to create more complete components such as phase shifters and true time delay (TTD) circuits. The armature is the part of the membrane that establishes RF contact. It is made of metal. The membrane is the moveable part. Depending on the design the membrane and the armature could be one and the same. The membrane is attracted using electrostatic force. The pull-down voltage is the DC (or RMS AC) voltage that is required to overcome the "spring" in the membrane to pull it down and actuate the switch. It is anywhere from 20 volts to upwards of 100 volts depending on the design. Here the armature makes direct contact to the transmission line. Here the armature contacts a dielectric film which encompasses the transmission line. In this case the MEMS switch acts as an electrically-controlled two-state capacitor. You may hear the "capacitance ratio" referred to in such capacitive MEMS switch, this is the ratio of the ON capacitance to the OFF capacitance, and might be around 100 for a good design. This discussion has been moved here. Reliability of MEMS typically means how many switch cycles you can expect given a certain set of operating conditions. This is the problem that continues to drive the MEMS switch industry, because the driving application for MEMS switches continues to be phased arrays which might need re-steered one hundred of times per second, which is 8.6 million times per day, 3.1 billion times per year. Some MEMS designs have been verified out to 100 billion cycles! Quoted switching speeds can vary from 5-100 microseconds. The actual time that it takes to move the membrane is in most cases probably less than 1 microsecond, the quoted longer times allow plenty of margin for switch bounce or slow driver circuitry. For high peak power pulses that are long compared to the actuation time, self-switching can be a major concern. For an Ohmic switch, self-switching is almost a sure way to destroy the switch. Hot switching means changing the state of the switch while RF signal is applied. In the case of Ohmic switches, as the switch closes the electric field due to RF is increased and even at very low power levels an electrostatic discharge (ESD) can occur. Even a very small ESD event can degrade the switch contacts. Radant specifies no more than -10 dBm RF power for hot switching or reliability can be affected. Capacitive designs will provide better hot switching power handling levels. the standoff voltage is the peak voltage that a MEMS circuit can handle in the open position before arcing occurs. There are fundamentally two types of MEMS switches, capacitive contact and Ohmic (DC) contact. DARPA seems to have decided that Ohmic is the way to go, the MEMS Improvement Program focuses on this type. HRL and Rockwell also have focused on Ohmic MEMS. Capacitive switches seem to be the odd man out. The Ohmic switch is typically cantilevered in series with a transmission line, so that the unbiased state the RF path is in a state of high isolation. One advantage Ohmic switches have is bandwidth; they don't have the high-pass response associated with capacitive switches. DC contacts are prone to damage during hot switching, far more than a capacitive contact. Hot switching can cause stiction, increased contact resistance, or outright destruction, switching more than 100 microwatts can affect the reliability of their switches. The capacitive switch is most often used as a shunt element. In the unbiased case the RF path is in a state of low-loss. However, there is no reason someone couldn't design a series capacitive switch to make the unbiased condition high-loss. As opposed to Ohmic MEMS switches, capacitive switches have a high-pass response. It is intuitive that capacitive MEMS switches will be able to withstand higher peak power levels without breaking down because the dielectric coating on the lower electrode will increase the ability to withstand high peak voltages. Capacitive MEMS switches are also much more immune to damage due to hot switching, perhaps several watts can be safely hot switched. MEMS switches may or may not have DC control signals separated from the RF line. IN the simplest "two-terminal" configuration, an Ohmic switch is actuated by imposing the DC voltage across the two RF terminals. In this case the user has to create his own bias network (often called a bias tee). Other implementations the membrane may have a separate area where the DC control signal is applied, this could add one or two more terminals that are decoupled from the two RF terminals. The typical MEMS switch user might have a preference for separate control terminals. Below are representations of three types of MEMS switches. The first device is capacitive and has only two terminals, so bias decoupling has to be considered. The second switch has three terminals, the "gate" is isolated from RF but the switch armature still needs to be at a controlled DC voltage. The third switch has four terminals with the RF armature fully isolated from the actuator. In each case it is a good idea to DC ground the input in order to protect the switch against ESD, a shunt inductor is shown in the schematic to address this issue. Yes, we know we need to add some images here to illustrate what we are talking about! Often gold is used for the MEMS conductors in contact switches, precious metals don't have to worry about oxidation that might mess up the switch's performance. Platinum is sometimes used and is regarded as more reliable for Ohmic switches because it is harder than gold. Capacitive switches often use aluminum conductors. MEMS substrate can be different materials. For example high-resistivity silicon (4000 ohm-cm) is one choice, but conduction through the substrate can affect the isolation that you could achieve at millimeterwave frequencies. Other MEMS switches have used GaAs or alumina substrates. Microstrip loss due to substrate conduction cannot be analyzed using ADS which makes designing anything on high resistivity silicon required EM analysis of simple fifty ohm lines using Sonnet or Momentum. So what's new in MEMS? MEMS switches have had some bad publicity in the past (even on this website), when they were used before the technology was ready. The environment the switch sees is extremely important (must remain clean and dry); employing MEMS switch technology deals as much with packaging as it does with the switch. Chip-scale packages that provide a low-cost hermetic enclosure have been developed that should improve MEMS reputation in the future. Two issues remain attached to MEMS switches that you should consider. Both affect reliable operation. These are ESD sensitivity, and hot switching. By understanding the problem you can minimize hardware problems. The problems are much worse for DC contact switches than for capacitive switches. Electrostatic discharge can easily be fatal to a MEMS switch. The gap being just a few microns in the open position, a spark can occur at voltages of perhaps 200 volts. The typical static electricity spark that you can see measures in thousands of volts! One zap and your switch may de\grade its performance, chance its pull down voltage, fail completely in either position. The way to minimize static is to provide some type of "lightning rod" that will conduct the static around the switch. Options include??? Hot switching can mess up a MEMS switch the same way that ESD does, and even with less energy. Because relatively high voltages are used to throw the MEMS switch, the question invariably comes up, how to interface it to "normal" electronics. Fear not, there are already suppliers out there that offer integrated solutions for you. But we won't give them a link here unless they cough up some cash!